I fell in love with Crossfit in May 2014, the first day I walked into CFC. It was love at first WOD (which, by the way, was Death by Burpees!). One of my favorite things about the sport of Crossfit is that whether you are a novice athlete, an elite athlete, or anywhere in between….it never, EVER gets easy or boring. Every single one of us is a work in progress, and there is nothing more rewarding than seeing the progress in the work we have put in! 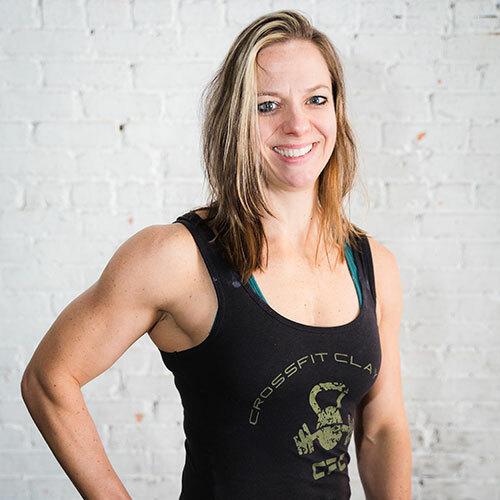 I became a Crossfit Level 1 trainer in July 2016 not only to gain a deeper knowledge and understanding of the sport, but because I LOVE watching our athletes grow and become stronger, faster, and achieve skills and meet goals they never thought were in their realm of possibility. I believe that pushing ourselves to achieve our full physical potential carries over into every other aspect of our lives. It makes us more prepared for and confident in everything we do. I am so blessed to be married to my awesome husband Tom. We live in Clayton with our two sons, Ian and Ryan, and our daughter Caelin. CFC has become a huge part of our household, especially since my whole family has joined! When we aren’t at the box, you can most likely find us at the hockey rink (all THREE of my kids play), or at home cuddling with our 2 spoiled dogs, Millsey and Robi.